"These baked pita chips make a lovely accompaniment to any dip or spread." Cut each pita bread into 8 triangles. Place triangles on lined cookie sheet. Bake in the preheated oven for about 7 minutes, or until lightly browned and crispy. Watch carefully, as they tend to burn easily! 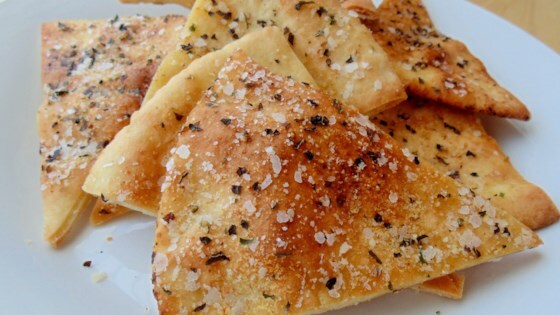 My daughter makes Pita chips similar to this, but she sprays each chip with cooking spray and then sprinkles them with Greek seasoning. These are so good I ate them plain after I ate all the hummus (hummusIII recipe). I used whole wheat pitas. I'm serious..these are super delicious.